Craft Explosion…And Not in a Good Way. How does a 2 second mistake turn into a 45 minute ordeal? You may be inclined to think that one of my angelic children was responsible for this, but oh no, you’d be wrong! This time it is ALL ON ME. This is what happens when you leave an open container filled to the brim with beads and findings and jump rings and clasps on top of a stereo and then turn said stereo up really loud during a bass-heavy song. It vibrates itself right onto the floor. This took forever to clean up. 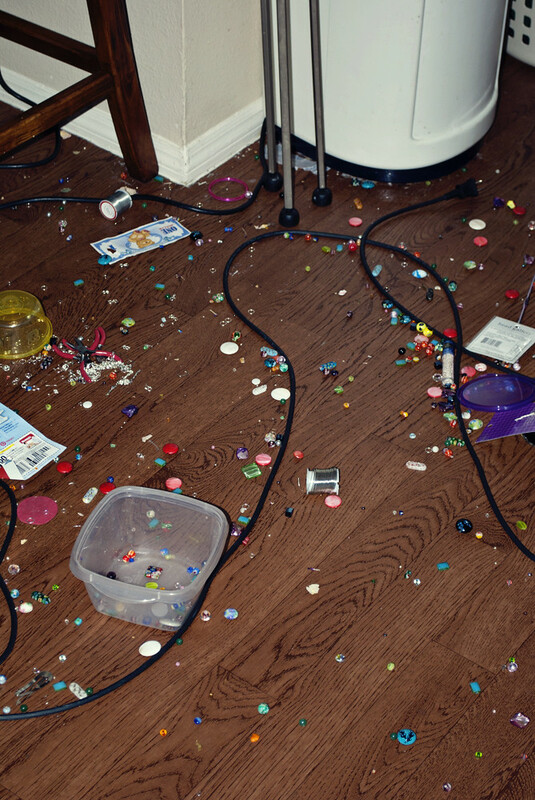 And it certainly didn’t help that four cats and two kids wanted to play in the mess/eat all my beads. And on that note, I should expect to find a large glass pearl in Delaney’s poo in the next few days.